Times sure have changed. When I was in Mr. Pauley’s fifth-grade class, we were mainly interested in afternoon recess to avenge the loss of our softball game during morning recess. The school play was the big topic of the year, and we struggled with learning who the presidents were. For the record, Kennedy was president while I was up to bat at the sandlot games. The other day, I got an email from Janet Hurley inviting me to come to Isaac Dickson Elementary School to be interviewed by one of her students, a young lady named Mabel. The topic of the interview was to be homelessness, and Mabel was creating a presentation from the interview; she plans to present it on June 2 at the TedX youth event in the auditorium. Figuring it would be something different to do, I agreed. I mean, how hard would it be to answer a kid’s questions about a topic that I know so well — homelessness. Was I in for a surprise. I met Janet at the door of the school. After chatting a few minutes about the project, she led me to the classroom where I would be interviewed, and she introduced me to Mabel. Settling into a kid-size chair at a kid-size table, Mabel told me what generated her interest in homelessness. There had been a fire at an apartment complex in which she had lived. Several families had been forced out of their apartments because of smoke and water damage and had nowhere else to go. This got her to thinking about the broader topic of people finding out that sometimes bad things happen to good people and they lose their shelter. Staring me in the eyes, she asked, “What can we do to end Homelessness in Asheville?” POW. This young lady cuts right to the chase — in the 5th grade and she’s asking questions that many adults don’t have the _____ desire to ask. I figured out immediately that this little lady had given the topic some thought and wasn’t going to be put off lightly by a grizzled ol’ vet with some tried-and-true answers. After an hour of getting peppered by questions, I was ready to head outside for a smoke and to hunt down a cup of coffee. Janet joined me outside, and while I smoked one we chatted. She shared more about the program that was coming up. Besides homelessness, some of the topics the kids picked to work on were autism, the impact on wildlife and the environment caused by throwing trash out the window, poverty in Haiti and a better school-lunch menu. 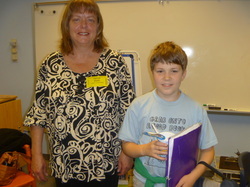 And Ms. Libby Kyles’ fifth-grade class was partnered with Janet to create the Writing to Change the World Project. The project focuses on global issues, using writing as a vehicle to show support, protest, persuade, explain and entertain — five things that many adults don’t seem to have the ability to do. 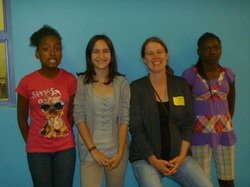 Even the website, http://www.tedxyouthisaacdickson.org, was researched, created and written by the fifth-grade students. Yep, times have changed. Except that part about wanting better school lunches. The brown bag lunches with topic mentors are going so well--if you haven't had your chance yet--be patient. I am lining up someone for each of you to talk to--some in groups--and it will happen. C____and B____ are already making a difference in the world. I'm honored and thrilled to be involved in this incredibly special process for them. My heart sings knowing our time together will culminate for them to publically hold their torches even higher! I am inspired by their commitment! Had a great time with the kids! I enjoyed it immensely!! I thought it was great... If I did my job, we'll have potential new climatologists in a few decades! The kids were great. Thank you for allowing me the chance to speak and meet with them. 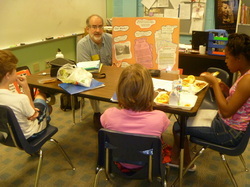 We are beginning to meet with topic mentors. What are topic mentors? They are folks who can talk with you about your topic--they are very well-informed or even, experts. Their role is to help you explore...by giving you some information you hadn't considered and probably couldn't find in the library or on the internet. Last week, students met with Monroe Gilmour from Western North Carolinian Citizens for an End to Institutional Bigotry and with Jenny Dissen, from the Cooperative Institute for Climate and Satellites. 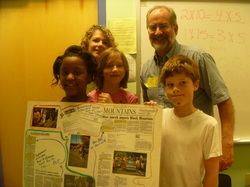 Mr. Gilmour met with three students to talk about the crossburnings that happened last year in Asheville, to talk about the work the organization does and to help the students explore what young people can do to take a stand against racism. Of course, just a few days later, Isaac Dickson Elementary marched through downtown Asheville as part of the Take a Stand Against Racism day. 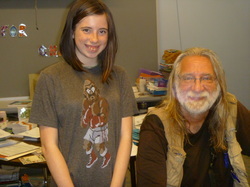 One of the students who met with Mr. Gilmour was even quoted--and mentioned Writing to Change the World. 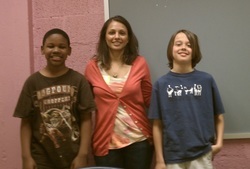 Ms. Dissen met with two students who are working on presentations that involve climate change. Before spring break, we explored the idea of burning questions--now we want to get them down and start exploring--will our beliefs about our topics change with new facts and new opinions from other people? What do we believe should be done about about the concerns that we have? We'll have some people in to talk with us about our topics soon...In the meantime, we'll be looking for some facts and opinions in newspapers, books, magazines and on the internet. We'll fill in page 2 and turn it in. The basic TED structure: To capture the spirit of a TED conference, we recommend you follow TED's own program structure -- it's evolved over 25 years of TED! 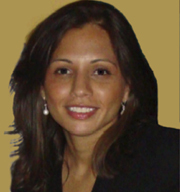 Format: Powerful, short talks focused on a single topic or idea. No talks exceed 18 minutes. Shorter talks are interspersed throughout. No keynote speeches -- all speakers are equal. No panel discussions. No breakout sessions. No Q&As. No podiums or lecterns. Schedule: We typically program 90-minute sessions, with four full-length speakers and a few short presentations. A full day would have four sessions, broken up by "conversation breaks" and lunch, and concluding with a reception/dinner. Be sure to allow generous breaks between sessions (your audience needs time to think about what they've seen), and try not to over-program! (It's stressful for you and for your audience.) No session should last longer than 105 minutes. Pad each session with an extra 15 minutes, to account for transitions, introductions and other small delays that inevitably occur. Keep a steady rhythm. Creating a program lineup Within each session, you'll want your program to cover a mix of topics that relate loosely to each other, allowing the audience to make connections and draw their own conclusions. Start strong: You'll want to open people's minds right from the start -- so be sure your event has a very strong opening. Mix it up: Break up your program with thrilling demonstrations and moving performances. Throw in a few shorter talks or counterpoints. End with emotion: Save the most emotionally gripping speakers and TEDTalks for the end. This is when your attendees are most open to being moved. It will leave them with a feeling that will stay with them -- perhaps motivate them into action. We've been talking about how good writers "show" more than "tell." In a good piece of writing--there is more showing--but the telling is important, too. Another way to think about this: writing "in scene" and writing "summary." In our letters to our legislators about saving school funding for teaching assistants, you wrote about a moment with a teaching assistant--about a specific point in time or event that made you feel assistants or tutors are important to you, your school, and your education. You created a word picture so that people in Raleigh can "see" what happened. That paragraph is called a "scene." Think of a play. In a play, something is happening and the characters are reacting. This is a scene. It's as if you (the writer) and your reader or audience is watching something happening right then. Then, there is summary. Summary is when you offer a point of view or look back and say what you thought about something or write a quick couple of sentences to get the reader to the next "scene." This week, I'd like for you to take the writing you've done about your issue and put it into the format that I give you (see document page). I've included an example of a This I Believe essay and pointed out what the writer is doing--we did this in class together--but this is something you can keep and use as you write your own essay. Assignment: Using the organizer I've given you, write an introduction, then plug in the writing you've done so far into the "scene" paragraph. You'll have to look at what you wrote first, then what you wrote after you received questions and comments from your classmates and from me. Choose the best of it for your middle paragraphs and feel free to add something you didn't think about before. Then write your conclusion.